The Laugh Pod is the most unique, modern, and fun photo booth experience in Connecticut. 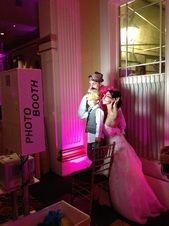 Offering a fun experience for your guests is what a photo booth is all about. Our Laugh Pod can be rented with, (or without) The Smile Lounge. We offer open and red carpet styles as well. The Smile Lounge is the perfect addition to The Laugh Pod. It wraps around The Laugh Pod with a beautiful white fabric to give your guests a cool place to gather and have fun. At only 8x8ft, it is incredibly compact, and open. A Social Kiosk is a stand-alone “Photo Kiosk” With this kiosk your guests can browse, print, share on Facebook/Twitter, or email their photo booth photos. Custom Lighting $50 per light (static color). Travel (if outside our service area of 40 miles). $1/mile. The Laugh Pod is perfect for any of your events - weddings, communion's, birthdays, baptisms, graduations, anniversaries, reunions, proms night, trade shows, conventions, marketing campaigns, sweet 16's, high school games, fairs, college fairs, corporate events, grand openings, fund-raisers, and other celebrations in Connecticut and beyond. Minium 2 hour rental. You will get an honest price. Although most events have similar pricing, certain criteria can change the overall pricing. Travel/location, date, hours, add-ons and other details are all considered to give you the best pricing possible. We like to hear about your event before offering a quote so that you don't pay for services you don't need.